A school of higher education for both Native American young men and the sons of the colonists was one of the earliest goals of the leaders of the Virginia Colony. The College was founded on February 8, 1693, under a royal charter (legally, letters patent) to “make, found and establish a certain Place of Universal Study, a perpetual College of Divinity, Philosophy, Languages, and other good arts and sciences…to be supported and maintained, in all time coming.” Named in honor of the reigning monarchs King William III and Queen Mary II, the College is the second oldest college in America. The original plans for the College date back to 1618, decades before Harvard. 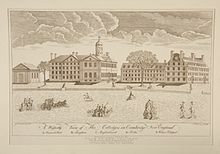 In 1695 before the town of Williamsburg existed, construction began on the Sir Christopher Wren Building, then known only as the College Building, and is the oldest college building in America. The College is one of the country’s nine Colonial Colleges founded before the American Revolution. The Charter named James Blair as the College’s first president (a lifetime appointment which he held until his death in 1743). William & Mary was founded as an Anglican institution; students were required to be members of the Church of England, and professors were required to declare adherence to the Thirty-Nine Articles. The school’s charter called for a center of higher education consisting of three schools. The Philosophy School instructed students in the advanced study of moral philosophy (logic, rhetoric, ethics) as well as natural philosophy (physics, metaphysics, and mathematics); upon completion of this coursework, the Divinity School prepared these young men for ordination in the Church of England. This curriculum made William & Mary the first American college with a full faculty. In 1693, the College was given a seat in the House of Burgesses and it was determined that the College would be supported by tobacco taxes and export duties on furs and animal skins. The College acquired a 330 acres (1.3 km2) parcel for the new school, 8 miles (13 km) from Jamestown. In 1694, the new school opened in temporary buildings. Williamsburg was granted a royal charter as a city in 1722 by the Crown and served as the capital of Colonial Virginia from 1699 to 1780. During this time, the College served as a law center and lawmakers frequently used its buildings. It educated future U.S. Presidents Thomas Jefferson, James Monroe, and John Tyler. The College has been called “the Alma Mater of a Nation” because of its close ties to America’s founding fathers. A 17-year-old George Washington received his surveyor’s license through the College and would return as its first American chancellor. William & Mary is famous for its firsts: the first U.S. institution with a Royal Charter, the first Greek-letter society (Phi Beta Kappa, founded in 1776), the first student honor code and the first law school in America. The College became a state-supported school in 1906 and went coed in 1918. In 1928, John D. Rockefeller, Jr. chose the Wren as the first building to be returned to its 18th-century appearance as part of the iconic Colonial Williamsburg restoration.